Another scene completed that uses a sound as the main focus, with the squirrel leaping away in fear. The wobbly lines of the sound grumble, is to show the movement and feeling you can experience when ones stomach is hungry. I painted this image using pastel pencils and using the specific colour palette. I tried to create as many finished images I could for my tutorial. 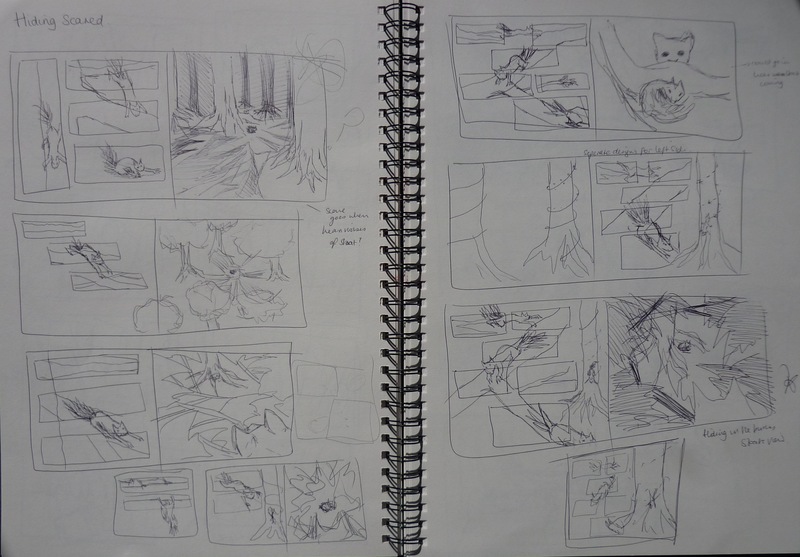 Here are the next sketches of some pages which look completely different to the final piece. I wasn’t too sure about adding a narrative and how to go about to it, so I asked my tutor and they suggested looking at text in other books and seeing if any would match the style of my work. From there I could just copy the font but maybe use a different colour instead of black as this again is too harsh for my style. I was also worried about how much text to add because I do not want this to dominate my images, a suggestion was made to maybe just use a symbol to express a moment instead of using words all the time. I knew that I shouldn’t put text straight onto the main image as this could create complications when editing work later on. So I am going to create the narrative when I have completed the final images and finished editing them. This entry was posted in Incorporating Sound.